When first we heard of Garmin's nüvifone (if it’s got an umlaut, it has to be good, right? ), it was in the cold winter days of February 2008 and the device was supposed to ship in the third quarter of that year. Fast forward to Tuesday, when Garmin announced the device would finally arrive in the U.S. on October 4 as an AT&T exclusive. Oh well, close enough for government work. The main selling point of the nüvifone G60, as it’s now known, is its focus on GPS navigation, for which it uses the same technology and interface that Garmin has packed into its standalone navigation units. Like those, the nüvifone G60 features turn-by-turn GPS directions. But it doesn’t stop there: it also has a Web browser, a virtual keyboard, MP3 playback, and email access. Hardware-wise, it’s got 3.55-inch screen at a resolution of 272x480, 4GB of onboard storage (half of which is occupied by the pre-loaded maps) and support for up to 16GB more via MicroSD cards, a built-in three megapixel camera with support for geotagging, and boasts up to 4 hours of talk time and up to 250 hours of standby time. Of course, a phone features far more varied functionality than a GPS unit, so it remains to be seen whether or not Garmin, a newcomer to the phone market, has the chops to pull it off. More to the point, when the nüvifone was first announced, Apple had yet to roll out the iPhone 3G, much less the 3GS. 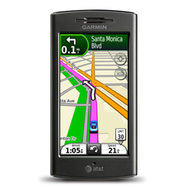 GPS navigation on smartphones isn’t novel anymore—it’s de rigueur. The phone will run $299 with a two-year contract and after a $100 mail-in-rebate (because those are so popular). If you want the “Premium Connected Services” which include traffic updates, white pages, weather, movie, local events, and fuel prices, you’ll need to pay an additional $6 per month on top of your usual fees. Will users be lured by the nüvifone’s promise of “true” GPS? If the device can perform its other functions well, then maybe, but I’m skeptical that doing one thing extremely well will be enough to convince the average customer looking for a smartphone.